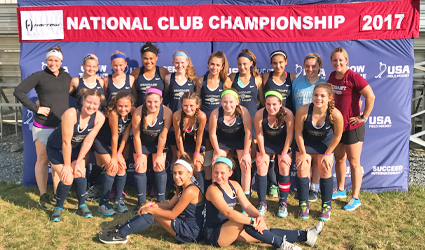 Throughout March, April, May and June, more than 100 club teams and 2,000 athletes competed at Regional Club Championship events, hopeful that they would qualify for the prestigious USA Field Hockey National Club Championship. The NCC is the most elite level of play in junior field hockey, and has expanded annually since inception in 2011. Only the top sixteen U-14, U-16 and U-19 teams from the RCC’s (Regional Club Championships) will earn a ticket to the National Club Championship presented by Harrow Sports. One club team in each age division will claim the highly coveted title of National Club Champions, and receive the gold Harrow Sports field hockey stick. The National Club Championship is an ideal opportunity for clubs to compete against each other in a highly competitive atmosphere and coincides with USA Field Hockey’s mission of growing playing opportunities and the game of field hockey in the United States. This year Seacoast United was extremely excited to be selected to host both the U14 & U16 RCC’s, for Region 1-4. This is the fourth time that Seacoast United has hosted the Regionals (2013- U19 Division, 2015- U19 Division, 2016- U14 Division), and last year the SUFH U14 Team came in 1st place in the region, and 10th place in the country at Nationals! After such an exciting experience in 2016, nothing could have prepared Seacoast United Field Hockey for what this year would hold. Not only did the U14 team come in 1st place at regionals for a second year in a row, but they defied the odds and finished 4th place in the country at the National Club Championship. This finish came after an overtime shootout in the quarterfinals, where goalkeeper Meredith King saved a stroke, and shooters Maddie Mullaney, Ashlyn Toupin and Callie Beauparlant found a way to put the ball in the net! This is the first time that Seacoast United has finished in the top four in the country, making club history! Seacoast United is so proud of each and every member of this young team, and look forward to the bright futures they all have ahead of them. This is a very exciting time for the Seacoast United Field Hockey program, and we can’t wait to start training again in November!